Gardeners who also grow pear trees soon learn to pick pears before they’re fully ripe. If left on the tree, pears ripen from the inside out, so will be mushy in the middle by the time the exterior is soft. So, pick them when they’re firm, but just starting to turn a yellowish green. Then let them fully mature in the refrigerator. Bartlett pears only need a day or two in the cold, while Bosc and Anjou pears need about two weeks. Cut the pears in half lengthwise, leaving the stem intact. 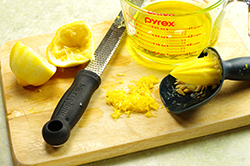 Using a sturdy teaspoon or a melon baller, remove the core from each half. 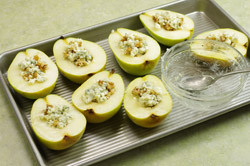 Place the pear halves on a baking sheet, cut side up. If necessary, trim the pears so they lie flat without rocking. Ina bowl, mix the melted butter and honey. 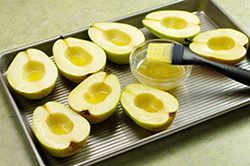 Brush the honey mixture over the cut surface of the pears. 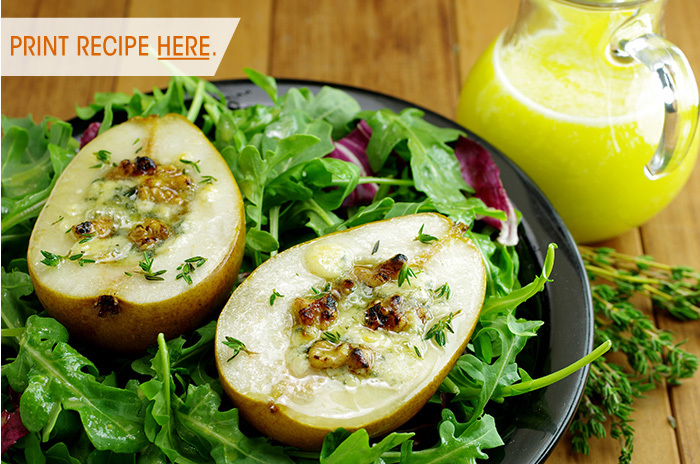 Sprinkle the pears with the crumbled blue cheese. Place the planks on the grill grate and close the lid. When the planks start to smoke and pop, after 3 to 5 minutes, open the lid and, using grill tongs, turn the planks over. Quickly place the pear halves on the planks, cut side up. 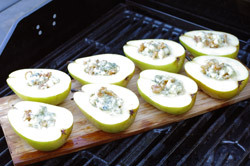 Cover and plank-roast for 12 to 15 minutes, or until the pears are scorched around the edges and the cheese has melted. Garnish with thyme sprigs and serve alongside mixed greens tossed with Lemon Caesar Vinaigrette. Preheat the oven to 450°F. 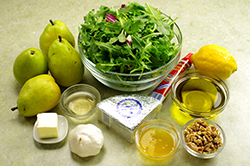 Place the pears on planks and roast in the center of the oven for 12 to 15 minutes, or until the pears are scorched around the edges. This has more citrus and less garlic than the traditional Caesar dressing and is wonderful on grilled greens or salads, or on vegetables, fish, shellfish, chicken, or pork – before or after grilling. 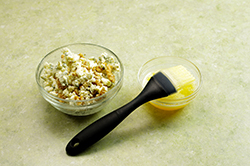 Use this for a lighter dressing on the Grilled Summer Slaw with Gorgonzola Vinaigrette. Drizzle this on a platter of fresh pasta with grilled vegetables. Anchovy paste is available in metal tubes at better grocery stores and gourmet shops, or you can buy canned anchovies and mash them with a fork. Combine all the ingredients in a small bowl. 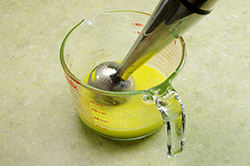 Use a hand-held blender to emulsify. Alternatively, combine in a food processor and pulse until fully blended. Store in the refrigerator for up to 1 week.